Bank bag is an organizer bag as well. 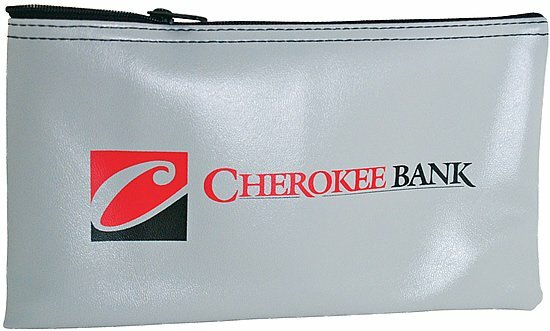 A must have promotional item for all financial related. Other applications are schools, hospitals, credit unions and most consumer business. zipper with zipper pull. Optional nickel split ring attached add $.20 each unit. Overall size of the coin bag is 10 1/2" w x 5 1/2" h. Bags bulk packaged. Delivery from date of an order for this bank bag is 4 weeks. This promotional product is Made in the USA. Price includes a one color imprint on one side in area 9" w x 4" h.
No Factory Setup Charge for first side, first color imprint. add a $50 set up and a run charge of $.30 each unit. Coin bag has a maximum of a three color imprint. We are a larger credit union with locations all over the state. I saw this bag on other sites for a lot more money. We bought a thousand bags to start, logo imprint was wonderfully done and the deposit bag itself is high quality. Well worth the low cost and we will reorder when it is time.